The wines of Portugal, outside of Port, don't get their due and it's time that they should. On the label of my wine pick you'll see that two places in the country are named: Alantejo and Moura. Alantejo is a rather large portion of southern Portugal and is famous for their cork oak forests. Moura is within southeastern Alantejo, bordering Spain. The 2007 Herdade dos Machados is a red blend from the native grapes of Aragonez (AKA Tempranillo), Trincadeira, Alfrocheiro and Castelao. It's been awarded wine competition silver medals in France and Germany, and received 91 points from Wine Enthusiast. At first glance the wine is dark ruby but at closer investigation it's turning brick from age. It has an intense and captivating nose of roses, figs, vanilla and cracked pepper. It's bold and hedonistic in the mouth with big dark fruit, rosemary and cedar. The tannin is soft on the midpalate but does show strength on the minty, cleansing finish. This is one of my favorite wines right now. It engages all of your senses and may have you slapping table tops. The combination of its acidity and savoriness make it an amazing food wine able to pair with delicate appetizers to the manliest steak. 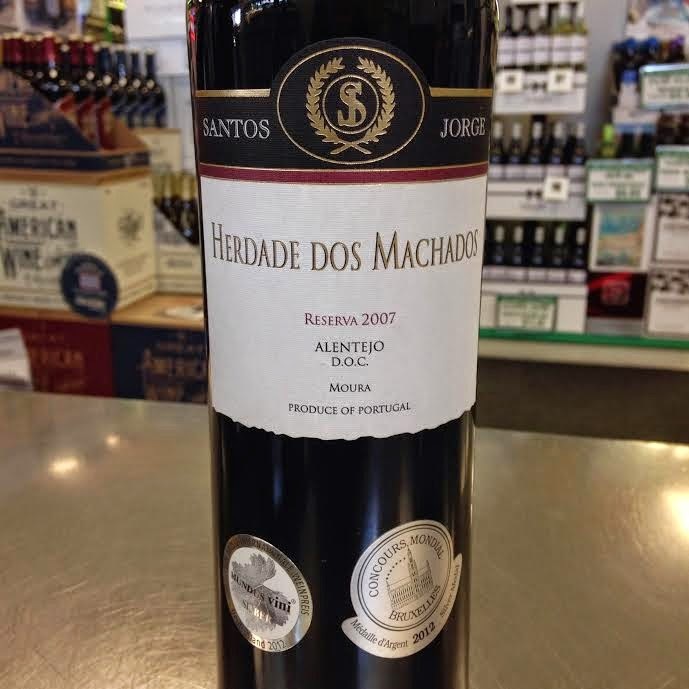 You'll have a wide range of food on your Thanksgiving table... maybe some Herdade dos Machados should be on there too. Rating: 5/5 = Highly Recommended.